If we decide to shrink the human species our livestock may need to shrink with us. We’ll only consume about 2 to 10% of the food we consume today. The meat of one chicken could easily feed 100 people and one egg alone would be enough to make an omelet for 25 to 30 people. Poultry/House is a research installation to investigate how this considerable drop in demand will affect the future farm and the relationship between livestock, city, consumer and producer. The investigation maps the historical relationship between man and livestock. It looks at how the farm / home developed into the farm / factory of today, and how this process might develop as we start to become smaller. As cities go through a rewilding process, and parks and other green areas are repurposed for local food production, how will we organize it? How will the proximity of food production affect our relationship with food products, and how will this local production be embedded in national and international systems of food production? 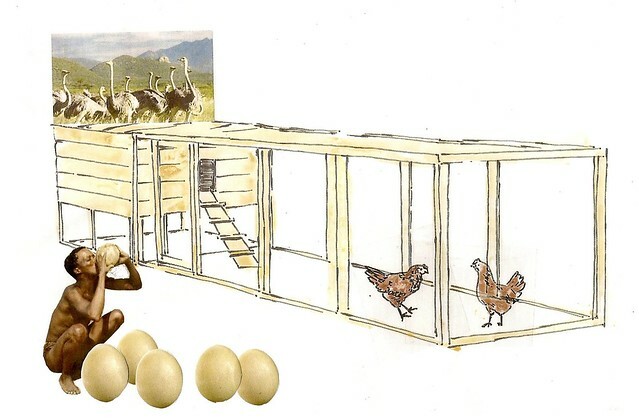 To symbolize this possible future proximity between food consumption and food production Poultry/House revisits the medieval homefarm where animals and people lived together in the same buildings. It’s a proximity most do not desire today but which acts as a reminder of the distance that has been created between us and the food we eat. We want to shrink towards fulfilling our needs, not grow away from them. Poultry / House was part of Food Forward.